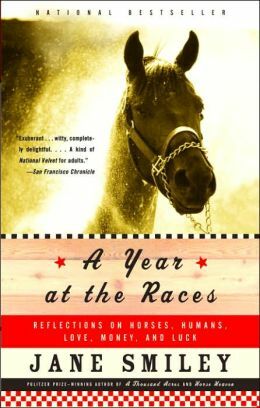 I’m not a fan of horse racing so I’m not sure how I found this book or why I decided to read it, but it was…interesting. My overall feeling about the book is amusement, it wasn’t an emotional story or particularly educational, but it’s fun. The author’s perspective is very intriguing. She got back into riding at middle-age, decided to start breeding horses for profit as a hobby, and randomly took two of her horses to the race track for training. The woman obviously has money but she does not go into how she funds all of this, which I would have been interested to know, because I would like to be able to do that much with horses for fun. Seriously, I want to breed Savy, I already know who her babies daddies are going to be. She gives examples of horses that fit into these traits and how training is affected by their personality. I thought it was really neat to think about where Savy fit into this scale. She is curious, friendly, and energetic. The tricky one for us is dominant/submissive. I’ve seen her display both traits while out in the field with her pasture mates…and with me. Undersaddle she did try to be dominant at first by tossing her head and trying to bully me, but we’ve fixed most of that behavior. I think she’s still figuring out where she fits in the herd. She wants to be dominant, but she doesn’t really follow through. 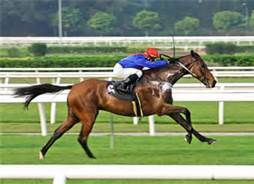 Her horse, Hornblower, was training and racing at Santa Anita. He started racing as a 2-year-old, then soon suffered an injury that had him out of commission for 8 or 9 months. He started racing again as a 3-year-old, and when he wasn’t winning any races, he told her animal physic that it was because of his name. So they renamed him Wowie…yeah. Also, she uses an animal psychic!! She uses what the horses “say” as part of her training program. She’s totally not joking either, and based on some of her stories, I’m dying to get a psychic out to read Savy. She has another horse at the track called Waterwheel, but she doesn’t go into as much detail about her. While horse racing seems exciting, this book is a perfect example of why I don’t like it. Wowie (formerly known as Hornblower) never had much success at the racetrack, so at the age of 4 she decided to retire him. When he came home to her farm, his poor feet were so neglected he could barely walk, and it took 5 months before he could function again. What’s especially terrible about this is that she was still paying the bills at the race track, and it’s just that his trainer didn’t pay attention enough to get his feet done. I hate the way that horses are treated at the tracks. Her other horse at the track, Waterwheel, was also started at age 2, but suffered career ending injuries after only 4 races. And by career ending I mean her entire career, not just racing. At 2 years old, she will never be useful to people again except in the capacity of a broodmare. The problem with this is that she doesn’t come from stellar bloodlines, and she never won a race. The demand for her babies is not going to be high. The unfortunate truth is that horses that are not useful to people do not get treated as well. Ironically, while I was reading this book I took a trip to Keenland (I had to go to meet my fiance’s dad so don’t judge me! ), and it is exciting. I just have a hard time reconciling those beautiful, glossy, muscular horses who are excited to go run, who can’t wait to go do what they were born to do, to the Off the Track Thoroughbreds that make it to the market once their racing career is over. Most off the track horses have to be rehabilitated before they can start their new career. For some horses this means surgery, and then recovery time, and for some it’s a few years out in a pasture “learning how to be a horse again”. After a few years the horses are started under saddle again (if they’re able) and sold yet again. Many, many retired race horses have completely successful second careers and they get to be loved by their person. Even for a horse that is lucky enough to remain uninjured and rehabilitated to a new career, it seems like an awful lot for that horse to go through in a short amount of time. Anywho, that’s my 2 cents. She ends the book talking about her own experience on horseback. She talks about how riding brings out traits in herself that not only apply to horses, but apply to her whole life. Some of these are not so positive, but riding makes you own up to them. It’s like seeing yourself in a mirror, and if you want to be a successful rider, you have to deal with it. For example she is “fearful”, “impatient”, “distractable”, “inconsistent” and “defensive”. This is how she rides, this is also how she lives her life. It’s also true that if we look at our horses behavior, we’ll see our own bad habits reflected. Fearful and distracted horses are often ridden by fearful and distracted riders. Some of my own bad qualities that I have in the saddle as well as in real life are “melodramatic” and “zoning out”. If Savy and I have a bad ride, I think it’s the end of the world and that I’m a terrible rider and that I’ve messed up her training for good. Megan has received many frantic phone calls from me while I’m still on Savy’s back for this very reason. I also tend to zone out and just coast along, not really paying attention to what we’re doing. Savy and I have actually run into walls and fences before, several times…no joke. But my biggest problem is connection. Connecting undersaddle and in my real life is something I have to consciously try to do. Anyone who knows me knows that I love to escape, mostly into a book. I could seriously spend my entire life sitting in a comfy chair, eating popcorn and reading. It used to drive my parents crazy. I was much more interested in reading about life experiences and adventures, than actually getting out there and doing it myself. This is why I love horses so much. When you’re around a horse, you have to be in the moment. How are you reflected in your horse?